Ultimately, the performance of your airgun depends on the quality and compatibility of the pellets you choose for it and each barrel can show preference for different type of pellet. BSA have made that choice simple by producing a range of pellets that have been specifically designed to perform to the highest standard in BSA barrels. 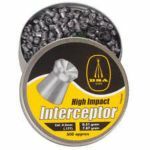 Every type of sporting airgun and every kind of shooting situation is catered for within our selection of precision-formed pellets. We know what our airguns need to produce top performance and these BSA pellets will deliver it for you. Choose BSA pellets for your BSA airgun – it really is that simple!